Imagine you're up to your eyeballs in contract work, getting ready for a major competition, organizing several work crews, and supporting your new hires. It's tough, but you think you've got it together . . . until one of the houses you're working on becomes a murder scene, and you and your employees are prime suspects. Welcome to Shannon Hammer's life. I really love my job. But I've got to admit, some days are better than others. I've been working on construction sites since I was eight years old and my father started taking my sister, Chloe. and me to work with him. Our mom had died a month earlier and it just made sense for Chloe and me to hang out with Dad after school instead of going home to a big, sad, empty house. Chloe and I thrived around the construction workers, who took us under their wings. They bought us little pink tool belts and hard hats and showed us all kinds of cool stuff make. Circumstances: As Lighthouse Cove is preparing for its Victorian Home and Garden Tour, competition is already heating up as contractors, workers, and homeowners vie to win the coveted Best in Show award. Shannon Hammer has her hands full, juggling several projects, but feeling in control. Then one of her job sites becomes a murder scene and the authorities begin to suspect Shannon or her crew. After a second victim is found Shannon and her friends sort through the clues to find the killer before he or she can strike again. Characters: Shannon is a well-respected contractor who has been around construction sites all her life. Her women friends include small business owners (of a B&B and a quilt store, for example), and then there's Mac, a famous thriller author who is becoming more than a friend. All the good: One of the most important elements of a good cozy (besides the mystery) is its protagonist. Shannon is smart, tough, sane, and professional and a good friend to boot. She runs a profitable construction business that proves women belong in the trades as much as men. The details about old houses and dealing with renovations are fairly accurate and the characters are multilayered with believable personalities. Finally, the mystery itself (along with a few twists) is well plotted and fun to try to figure out. Wait, there's more! The Fixer-Upper series has been picked up by Hallmark Channel's Movies & Mysteries. The two movies made so far, Framed for Murder and Concrete Evidence, star Jewel and Colin Ferguson as Shannon and Mac. See the following video. A few links: Kate Carlisle's website includes a brief introduction to the Fixer-Upper series. Kings River Life magazine has a great interview with Carlisle that focuses on the series and Hallmark movies. 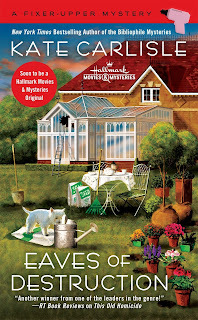 Finally, the Hallmark site has more videos, photos, and information about Framed for Murder. Thanks to the good people at Berkley Prime Crime, I have one copy of Eaves of Destruction to giveaway to one of my readers. All you have to do to enter for a chance to win is to have a U.S. mailing address and to fill out the following form. I'll pick a winner via random number generator on November 30. Once the winner has been confirmed, I'll delete all personal information from my computer. Good luck! NOTE: Google forms is acting up. If there is no form, please provide your email address in the comments and I will make sure you're entered for a chance to win. I am not sure about this just because I always like the sound of cozy mysteries but never end up reading them. Sounds like fun. Thanks for the giveaway! sounds great! Mine is here: https://francebooktours.com/2017/11/07/teaser-tuesday-drawing-lessons/ and actaully there's also a giveaway with it! I love the Hallmark Channel Fixer-Upper series...and those opening lines definitely grabbed me. Thanks for sharing. The first paragraph has me already feeling connected to the characters. I'd like to keep reading. 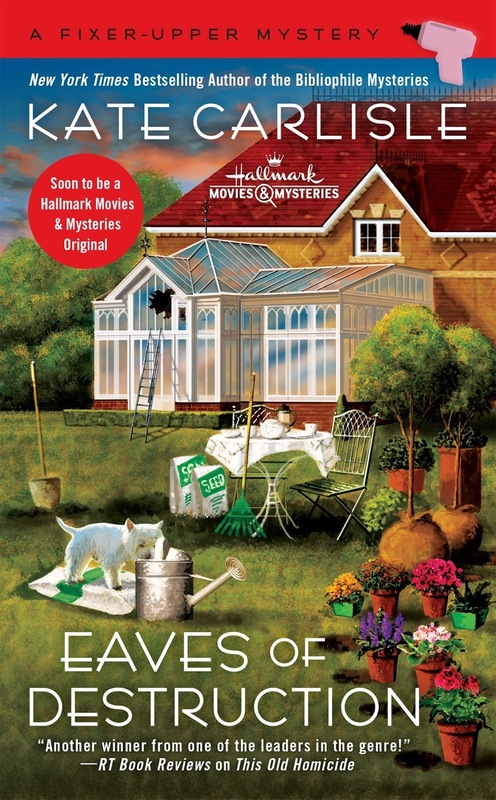 I love the Fixer-Uppers series - both the books and the Hallmark movies! Thanks for a great giveaway. I have been seeing this book around. It sounds good. This week my book is A Peace Divided by Tanya Huff. Happy reading! LOL - isn't that the truth of most jobs!! I have the first 3 books in this series sitting on my shelf just waiting to be read. I'm so excited to get to them. This newest one looks fantastic! I love the fact that main character is a contractor!